Description: An ornamental cross with straight arms terminating in broad finials decorated with imperial crowns. The royal cypher GRI appears at the centre and the cross is suspended from a plain suspension bar. Ribbon: Three equal stripes of white, deep purple and white. Comments: Originally awarded to captains, lieutenants and warrent officers of the army (including RFC), it was subsequently extended to include equivalent ranks of the RAF when performing acts of bravery on the ground. There was also provision for the Royal Naval Division and the Royal Marines during the First World War. 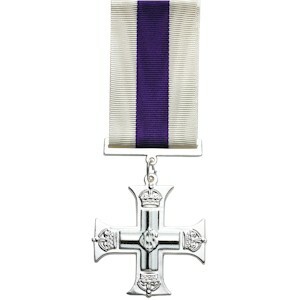 Awards were extended to include equivalent ranks of the RAF when performing acts of bravery on the ground. There was also provision for the Royal Naval Division and the Royal Marines during the First World War. Awards were extended to majors by an amending warrant of 1931. The MC is always issued unnamed, although since about 1938, the reverse of the cross or bar is officially dated with the year of issue. This award is now available to both officers and other ranks.